↑ L. Davis, William; Figgins, Bob; Hedengren, David; B. Klein, Daniel (May 2011). "Economics Professors' Favorite Economic Thinkers, Journals, and Blogs (along with Party and Policy Views)" (PDF). Econ Journal Watch. 8 (2): 133. ↑ Smith, Adam (1977) . An Inquiry into the Nature and Causes of the Wealth of Nations. University of Chicago Press. ISBN 0-226-76374-9. 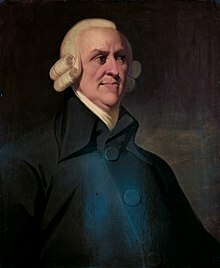 Adam Smith (1723–1790). The Concise Encyclopedia of Economics. Library of Economics and Liberty (2nd ed.). Liberty Fund. 2008.